For this recipe, you will need mixing bowls, a whisk, an 8" spring form pan, spatula, measuring spoons, and measuring cups. Mix 2 cups of graham cracker crumbs with cinnamon, brown sugar, and nutmeg in a mixing bowl. Pour in one stick of melted butter and mix until thoroughly combined. Pour into your spring form pan and press from the center out, creating a 1 ½ inch high border. Place into the refrigerator to set up. In your mixing bowl, whisk two eggs with cinnamon, ginger, nutmeg, vanilla, a pinch of salt. Add in the sweetened condensed milk and one can of pumpkin, whisk to combine. 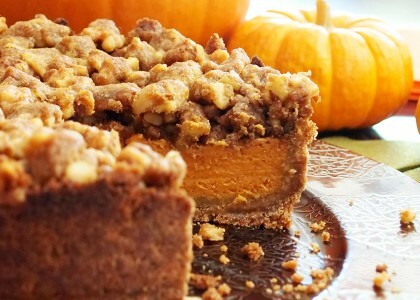 Remove your graham cracker crust from the refrigerator and pour the pumpkin mixture into it. Place into your oven and bake for 10 minutes at 425F, then turn it down to 350F for 30 minutes. 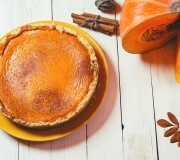 While the pie is baking, mix together one cup of Eatnuts.com Chopped Walnuts, ⅔ cup of brown sugar, ⅔ cup of flour, 1 teaspoon of cinnamon. 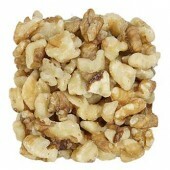 Add in 6 tablespoons of cubed butter and cut into the walnut topping mixture until all the flour is coated and crumbly. When the 30 minutes is up for the pie, remove it from the oven and carefully top with the walnut mixture. Pat down gently to make sure it is level. Return to the oven for 20 minutes, or just until the top begins to crisp up. Remove the pie from the oven and let cool at least one hour before removing from the spring form pan. 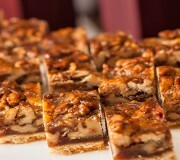 Cut a slice and enjoy! 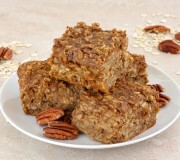 If you have ever been looking for the perfect healthy Pecan Bar or Pecan Square recipe, look no further.